It is a trend we have heard about at every industry conference from the U.S. Composting Council, to WasteExpo to SWANApalooza: recovering organics, the largest percentage of the waste stream, is going to take changes to state and local government recycling policy. This policy shift has taken place at the local level in the form of exclusive franchise agreements, requiring franchise holders to meet organic diversion targets or pay hefty fines such as the City of Los Angeles, and also through city-wide mandatory organics recycling ordinances like in Austin, TX or San Francisco. State legislatures have also taken a stab at organics recycling policy. With Northeastern states like Connecticut and Massachusetts taking a more conservative approach, focusing only on the largest commercial generators of wasted food, the West Coast has set, by far, the most aggressive targets for organics recycling across the country. California’s SB 1383 requires the state to divert 50 percent of organics from disposal by 2022 and 75 percent by 2025. This will require local governments to roll out commercial and residential organics collection programs in short order, and in many cases, these programs will take on educating a mostly uninformed public, unfamiliar with the “rules” of organics recycling. Compology’s camera-based, artificially intelligent container monitoring system captures data on fullness and contamination. Policy change is not enough, however, if the same old methods of collection are applied. While we are seeing various approaches in response to policy shifts across the U.S., the results are largely the same. Contamination of the organics stream is a persistent and complicated problem that organics recycling programs applying traditional methods are facing, no matter the geography or demographic. The State of Washington realized the impacts contamination was having on their organics recycling rates. Increased contamination results in increased labor, equipment maintenance and capital costs for organics processors and these added costs find their way back to collection rates. Washington decided to convene a group of experts and work with Washington State University to tackle contamination of the organics stream. Through their research, this group found that “While most contracts require the hauler to refuse contaminated organic materials, in practice contractual requirements are often either not observed by the driver or not enforced by the local jurisdiction. Close inspection of cart contents is hampered by automated collection methods, and the necessary follow-up and enforcement are often critically limited due to staff availability in smaller jurisdictions.” Clearly, the monitoring, reporting and historical tracking of contamination are falling victim to human error and inconsistent actions. While aggressive organics recycling policies give us a great opportunity to build and sustain domestic recyclable commodities markets, they also create the threat of creating a domestic national sword. Organics recycling success is dependent on our industry’s ability to properly motivate and educate waste generators to stop contamination at its source. We must not only ensure that we are rolling out the strictest monitoring standards for contamination while providing frequent and consistent feedback to our customers, but also ensure that we are using the tools that set us up for domestic recycling success. So, how do we accomplish this eco-nomically with tools available today? Artificial intelligence and the Industrial Internet of Things are currently helping us identify contamination to improve hauler operations and educate generators to stop contamination at the source. In the solid waste and recycling industry, education has always been a key component to rolling out any new programs in order to gain customer buy-in and participation. Who doesn’t remember the elementary school assemblies featuring the big blue bin urging us to recycle our bottles and cans? That oversized stuffed blue bin might have been what spurred my lifelong love affair with recycling! While school assemblies may work for one important demographic, education of all customers in a way that best reaches them, and, most importantly, results in action, is vitally important to the health of our recycling streams. In a time where recycling programs are changing drastically to match markets, we need to re-assess how we communicate important programmatic information to our customers. The Recycling Partnership has undertaken several case studies on contamination in blue bins and has discovered how consistent, easy to understand feedback can reduce contamination in residential recycling bins. This study also shows that education and feedback must be highly targeted, focused and constant. The Recycling Partnership’s method of audit and feedback was a visual inspection of residential recycling bins to determine customer compliance and “bin-tagging” to educate the customer about what is considered contamination and what is considered recyclable in their program. While manual, visual audits followed by a bin tagging campaign may work for residential programs, it can be costly and rely heavily on human capital and, therefore, unlikely to be replicated annually. Meanwhile, current market conditions may have us changing what is and is not recyclable practically overnight. In a digital age, where few, if any, customers are reading the newsletters that accompany their garbage bills, it is vitally important that we find new ways to reach them. We also need this outreach and feedback to not only raise awareness but to also actually result in changed behavior. What if we had a way to provide feedback to customers in real-time, in ways that they are already receiving information? One solution, that allows users to provide feedback to customers using images of container contents, are cameras installed in commercial customer’s bins. Each camera takes pictures of the contents inside each container to get a layer by layer look as a dumpster fills. These pictures tell a progressive story about customers’ recycling habits and provide the how, what, and when of contamination. While visual audits and bin tagging tells a customer how they are recycling using words, cameras can offer photographic proof of contamination, nearly real-time, customer specific feedback and coaching and even a contamination score. As the saying goes, a picture is worth a thousand words and images have a staying power that words on a tag simply cannot match. In fact, the brain processes images 60,000 times faster than it does text. 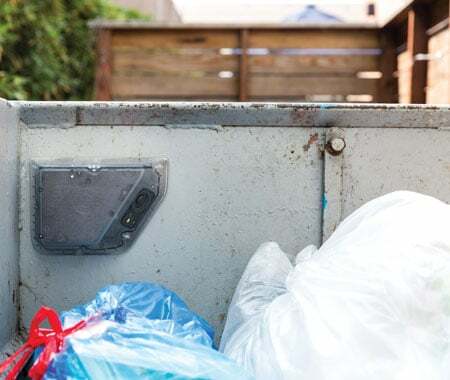 Cameras and artificial intelligence technology allow users to remotely monitor the contents of and measure contamination in customer dumpsters, providing the only dumpster monitoring solution offering this type of feedback affordably, efficiently and effectively at scale. Camera users can target specific types of contamination that are seen most frequently in programs. For example, plastic bags can be an expensive and hard to manage contaminant in most recycling streams. Some customers may believe since the bag is plastic, it is considered recyclable. With cameras in place, plastic bags could easily be identified by the software as contamination, then be flagged by the system to alert both the user (hauler, city government or generator) and customer through e-mail or text message that their recycling bin is contaminated. Accompanying this message is photographic evidence of the contamination. For commercial customers, this information can help them identify who (or which location) in the business has contaminated the recycling bin, which helps streamline the feedback, training and education needed to change recycling behavior. Are you a hauler rolling out a new organics recycling program or making drastic changes to your current recycling programs? Or perhaps you are a municipal recycling coordinator, frustrated by the inconsistent adoption of recycling programs in your city? Are you a sustainably minded company that wishes to reduce your environmental footprint and avoid fees for contaminated recycling bins? Container audit and customer education and feedback should be an essential part of your program. Compology measures contamination by capturing in-dumpster images and applying artificial intelligence to scan and identify contents. If you answered yes to any of the above questions, then a robust and consistent dumpster audit and customer feedback system are necessary to ensure recycling success for your organization. Amid drastic changes in recycling market conditions and no clear pathway towards domestic infrastructure development, it is time to rethink how we collect our recycling streams and what metrics we are tracking for success. An investment in tools to standardize measurement and reduce contamination now can result in huge savings at the processor, where many operators have implemented tiered pricing based on the level of contamination in the recycling load. Rachel Oster is Principal at Diversion Strategies and an experienced professional in the solid waste and recycling industry. She specializes in the development and operation of solid waste infrastructure including compost facilities, landfill operations and material recovery facilities. Rachel can be reached at info@diversionstrategies.com.